Sweet Basil Genovese Ocimum Basilicum Genovese is an ornamental and culinary herb that belongs to the Ocimum family. The Sweet Basil seeds are one of the easiest to grow, and the Genovese variety produces bushy, exceptionally tender, aromatic annual herb plants with shiny green leaves and small, fragrant white flowers. Genovese Sweet Basil blooms in summer and fall, and the spikes of highly scented basil flowers attract bees and butterflies. Sweet Basil Genovese is grown as a decorative plant that is also an excellent repellent, so Basil is often planted in containers and pots on a patio or deck to keep away mosquitoes and flies. Ocimum Basilicum Genovese seeds can be started directly outdoors after last frost. The growing Basil needs plenty of sunlight and rich, well-drained soil to grow and flower. 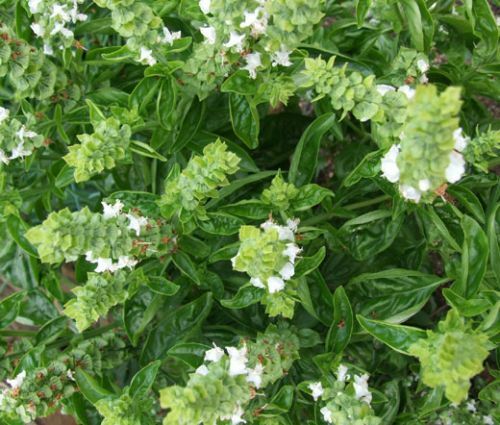 Since the basil herb plant stops growing after its flowers mature, it is recommended to pinch of the stems that are flowering to ensure that Basil continues to produce leaves. Genovese Sweet Basil is one of the major components of pesto alla Genovese and other culinary uses of the Basil leaves, flowers, and seeds include seasoning in tomato sauce, pizza, salad dressing, and cooked vegetable dishes, as well as desserts, including ice cream and sorbet, custard and zabaglione.